- Place the 1/4 cup macadamias in a food processor or mortar and pestle and grind coarsely with the garlic. Add enough of the macadamia oil to make a thick sauce, then mix in half of the parmesan and basil. Season with the pepper. Set aside. - Cook linguini according to directions and drain well. Toss with the remaining oil to coat noodles. Return to the saucepan and fold in the sauce. 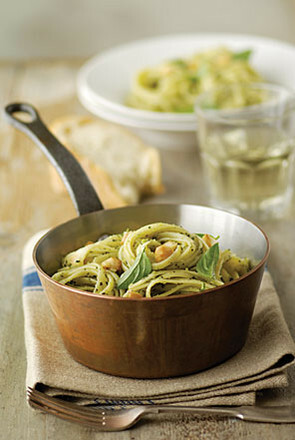 - Serve with the extra macadamias, parmesan and basil sprinkled over. Note: This sauce is also delicious with some freshly cooked prawns tossed through.